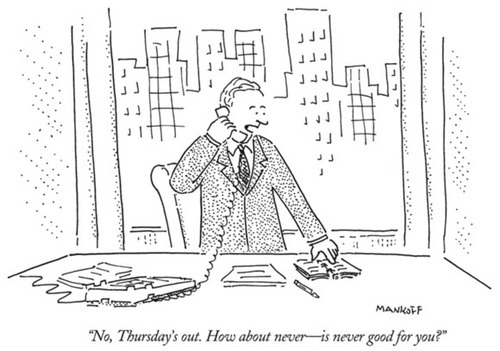 From The New Yorker tumblr. Time: 7:00 Sunday morning, just returned from my morning walk on a very cloudy day. Place: At my main computer, typing another Sunday Salon, somewhat to my surprise! Reading: As I haven’t checked in for several weeks, I’ll start with a few quick updates. I have finished reading Roger Lipsey’s The Spiritual in Twentieth-Century Art (a review of which is about 75% complete and will be appearing here in a few days), The Circle by Dave Eggers, and Michael Coe’s Angkor and the Khmer Civilization. I am in the middle of Finding Your Own North Star: Claiming the Life You Were Meant to Live by Martha Beck, which I am hoping will give me some answers to important questions. I have also made good progress in Austin Kleon’s Show Your Work, and may well finish it today. While I’m enjoying Kleon’s latest, it isn’t grabbing me quite the way his Steal Like An Artist, which I reviewed, did. Perhaps this is because the earlier book dealt more with the nature of creation, whereas this new effort is focused more on getting yourself and your work in front of an audience. I am happy to see, though, that one of the major themes in the new book matches up with my way of thinking – focus on things you really care about, and others who are interested in those same things will make their way to you.